The press release posted here was the first in the United States to announce a plan to install Talking ATMs. Using the Structured Negotiations process, Wells Fargo worked with the California Council of the Blind and several blind individuals to reach an historic agreement requiring installation of Talking ATMs and provision of alternative formats for print financial information. The Law Office of Lainey Feingold and co-counsel Linda Dardarian, along with the Disability Rights Education & Defense Fund represented the blind individuals and CCB. This release was the first of several concerning Wells Fargo’s Talking ATM program. Read the press release announcing the first 20 Wells Fargo Talking ATMs. In 2002, Wells Fargo announced state-wide plans for Talking ATMs in Iowa and Talking ATMs in Utah, and in 2003 Wells Fargo announced that its Talking ATMs would provide spoken instruction in Spanish. By 2009, all of the banks more than 7000 ATMs are Talking ATMs. Council of the Blind announced today what they believe to be the first plan in the nation for developing and installing talking ATMs. The plan calls for Wells Fargo to pilot 20 talking ATMs in the Bay Area and Los Angeles and San Diego counties. After the successful completion of the pilot next year, Wells Fargo will begin to install a talking ATM at each of the more than 1,500 Wells Fargo ATM locations in California. The technology, still in development, will give voice instruction to users who cannot read information on an ATM screen, on how to deposit money, withdraw cash, transfer funds and buy stamps. 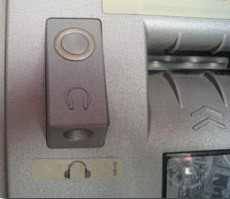 The ATMs will have audio jacks to deliver voice information privately to protect the security of blind and low vision users. Wells Fargo has shown a tremendous commitment to the blind and low vision community, more than any other financial services company in the nation that we know of. They’ve worked hard with us to improve access to their ATMs for a very important segment of customers. — Catherine Skivers, president of the California Council of the Blind . Our number one priority is customer service. We’ve been following the development of this promising technology and we look forward to testing and rolling out talking ATMs and to working closely with the California Council of the Blind to improve ATM access for vision impaired customers,” said Terri Dial, Wells Fargo’s head of retail banking in California. The California Council, with 46 chapters statewide, is an affiliate of the American Council of the Blind. Four blind individuals; the Disability Rights Education and Defense Fund, Berkeley; the law firm of Saperstein, Goldstein, Demchak & Baller, Oakland; and the Law Office of Elaine B. Feingold, Berkeley; also participated in the planning. In California, Wells Fargo – a diversified financial services company – provides banking, insurance, investments, mortgages, and consumer finance from more than 1,300 stores and other distribution channels.